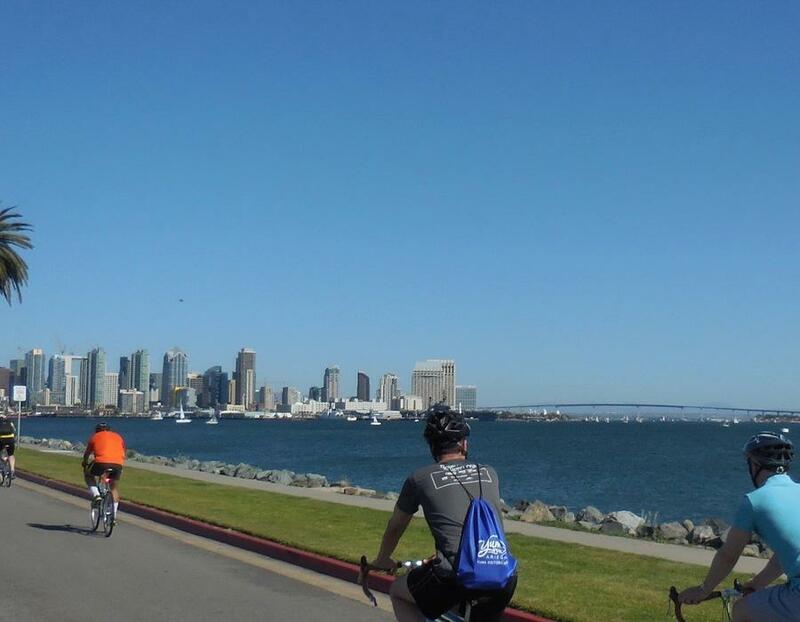 Riding through Mission Bay and San Diego Bay you'll see the best of the best in San Diego. From Mission Bay's Fiesta Island we circle north then west to Mission Beach the Ocean and the western most bridge over the San Diego River through Point Loma and Harbor Island. On Harbor Island we'll enjoy a full length view of San Diego Bay, its surrounding cities and landmarks, with a special nod to San Diego's maritime roots. Next up, a trip back in time to famed Naval Training Center San Diego, reborn in the 1990's as Liberty Station. 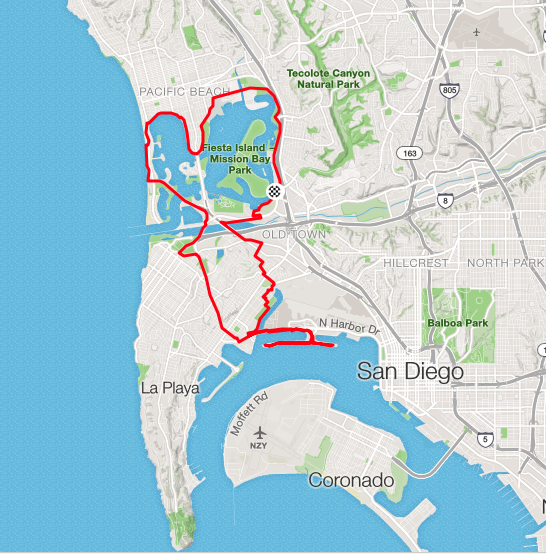 That done, we'll cross the San Diego River and complete our circumnavigation of Mission Bay at Fiesta Island. For iconic scenery, this is a gold mine tour of San Diego. Starting at Fiesta Island in the south east corner of Mission Bay we roll north then west around the Bay through Pacific Beach and Mission Beach to the Pacific Ocean. We cross the San Diego River to reach Point Loma and Harbor Island where, on an out and back circuit, we'll enjoy iconic San Diego Bay of today and our Portuguese origin. 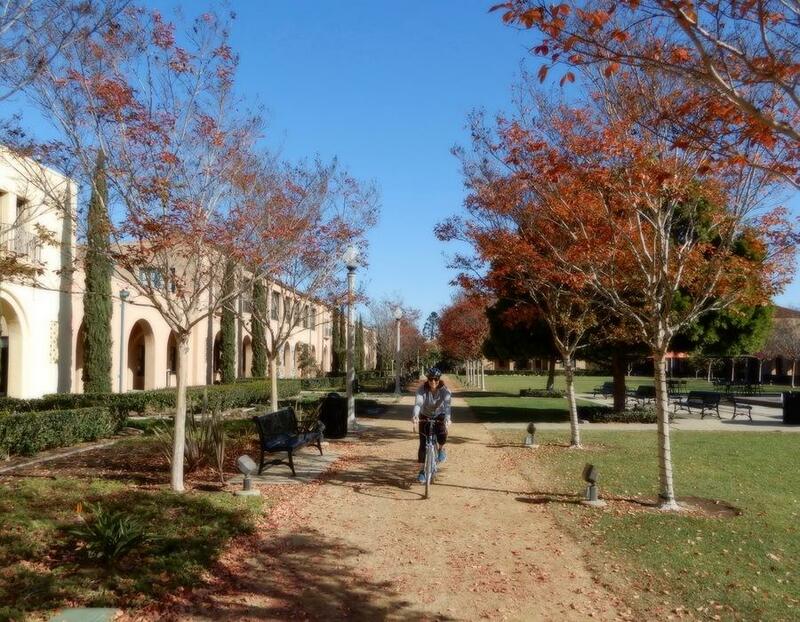 Continuing this explorer's tour our next visit is to Liberty Station, formerly Naval Training Center (NTC) San Diego, with a history so rich that it boasts its own self guided walking tour of its glory days as NTC San Diego. 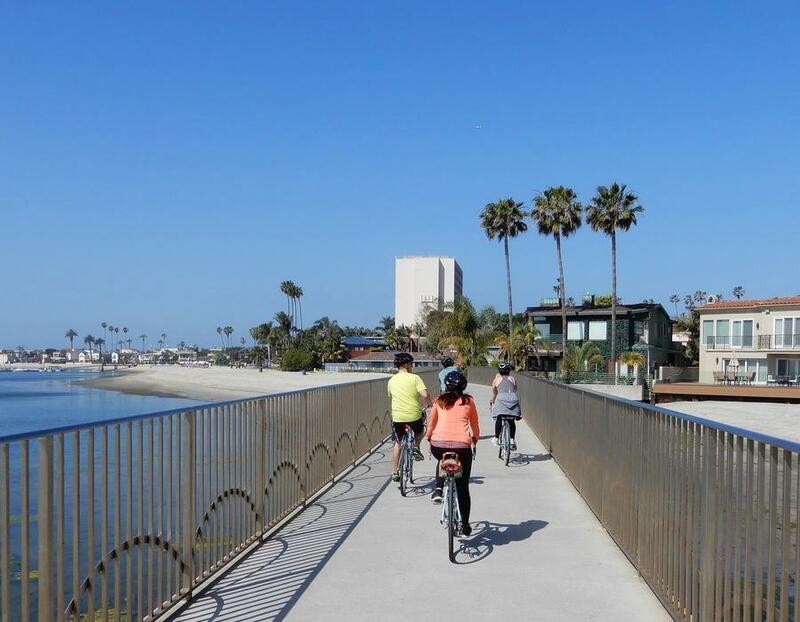 Leaving along the old river channel and the San Diego River bike path we reach Mission Bay and Fiesta Island which San Diegans proudly hail the hub of outdoor sporting activities. 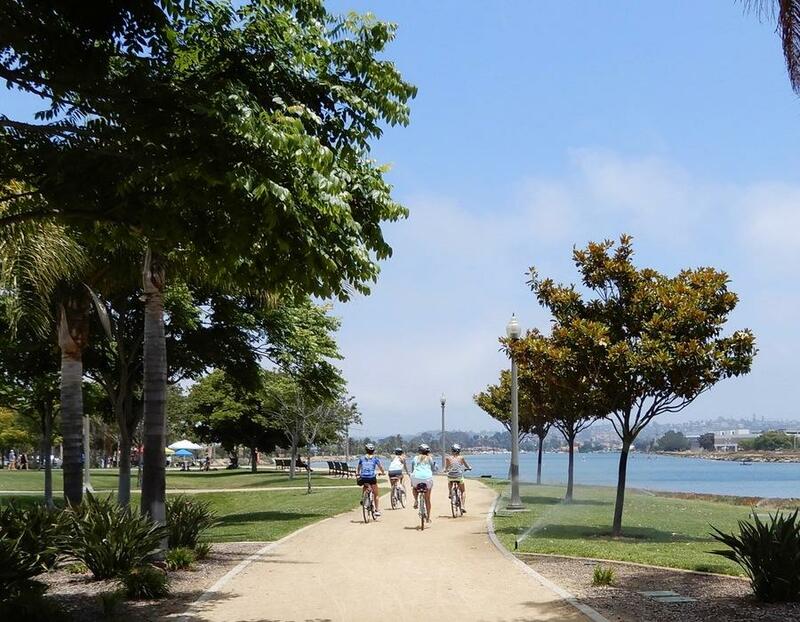 Having returned to our starting point we could call it a day but, before you put the kickstand down for the last time, consider a victory lap around Fiesta Island, a fitting place to say, "you're beautiful" San Diego, thank you. We typically stop at a cafe bakery in Liberty Station near the end of the ride. Two easy climbs and big time scenery make this the premiere take-it-all-in ride in America's Finest City. 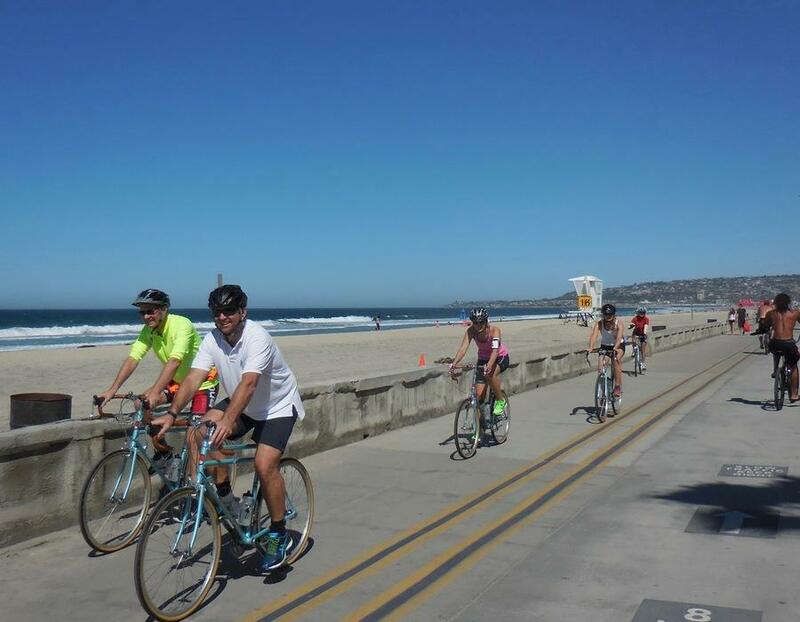 In a somewhat short ride with minimal climbing you'll explore Pacific Beach, Mission Bay, Point Loma, San Diego Bay, Harbor Island and Liberty Station for a bit of local history. Start times for this route are flexible, both morning and afternoon start times work well. The route passes several hotels which allows for the possibility of starting the ride from your hotel. We will stop along the the route for water and restrooms as needed. Variations to the route are possible to shorten or lengthen the ride if desired.